Journaling says: One day in October the South Pas moms all drove out to Simi Valley to check out Underwood Family Farms. There was so much to do! We could have spent all day there. Fox loved the pumpkins. Tip: To make the leaves I punched tons of little diamonds from every patterned paper in the Studio Calico Field Guide kit. I arranged them in a sort of leaf pattern on a transparency so I could move them around easily. I added some stitching to make them look more like leaves and then they became the focal point of my layout! 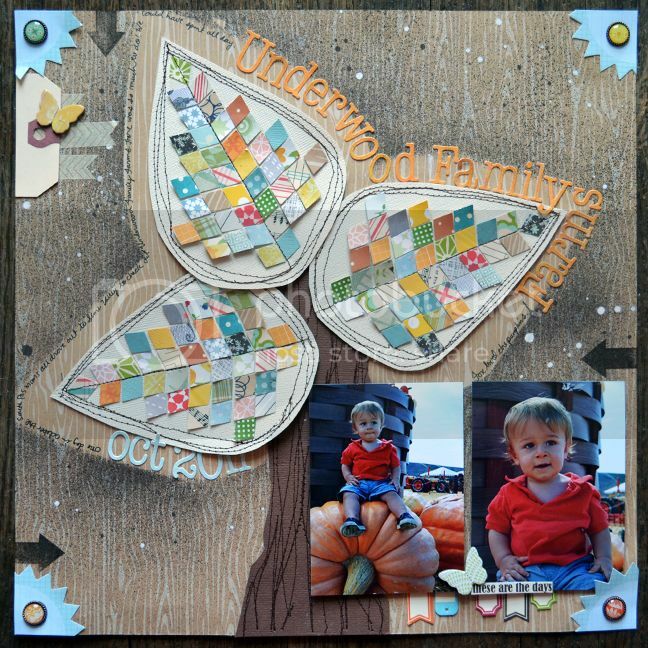 When did you start scrapbooking and what got you started? I started scrapbooking when I was 16 and got my very first job at a scrapbooking store (it wasn’t even my first choice for a job but boy am I glad it worked out the way it did!). My life has revolved around scrapbooking ever since! I worked there (Yesterday’s Scrapbooking & Stuff) until I left for college and got a job at Pebbles In My Pocket, then I started working for Northridge Publishing (they publish Scrapbook Trends, CARDS, the Create: series, Simply Handmade, Bead Trends, and the new Cricut Mags) where I still work for from home going on 6 years now; I was an In House Scrapbooker/Product Designer for American Crafts for 20 months and now I’m their Blog Hostess and Design Team Manager. I also had a brief stint at Archiver’s. My how 10 years of scrapbooking has flown by! What are your top 5 favorite products and why? #1 – patterned paper because there are unlimited choices and I love all the things that can be created with it. #2 – fabric brads because they can be incorporated onto pretty much any project and I love the bit of texture and pop of color they add. 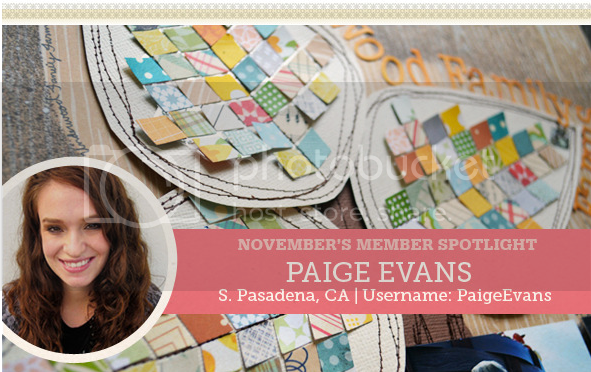 #3 – Bits decorative tags by American Crafts because they’re the perfect blend of design and cuteness. #4 – punches because they can be used in so many different ways over and over again. #5 – my sewing machine because it gives all my projects that perfect finishing touch and I love the “homemade/homespun” look. What is your favorite Studio Calico product and why? I know I’m going to sound like a broken record here, but the patterned paper is my favorite! Every piece is usable! What is your favorite go-to or signature technique? Because I love using lots of different patterned papers on my layouts and projects any kind of paper technique where I can show off as much patterned paper as possible is okay in my book! What is your favorite color and/or color combo? Does rainbow count as a color? I’m all about bright, happy, and fun color combos! Tell us a bit about your design process. I start with a super simple sketch of what I have in mind. Usually it involves a lot of patterned paper so I’ll choose my papers based on the colors of the photo/s and then cut into them to make the embellishments or background. I don’t adhere anything until I’ve figured out the placement. Lots of times I step away from my projects and come back several hours later when new inspiration comes to mind. Tell us a bit about what else you do since we know you are creative in more ways than just scrapbooking. I’ve been a mommy for just over a year now so that takes up most of my time! I also love to bookbind, dabble in fine arts like painting and drawing, and home décor projects are always fun. Someday I’d like to get back into the design aspect of scrapbooking. There’s nothing like seeing products you’ve designed in stores or on layouts of friends in this awesome community! Congrats to you!! 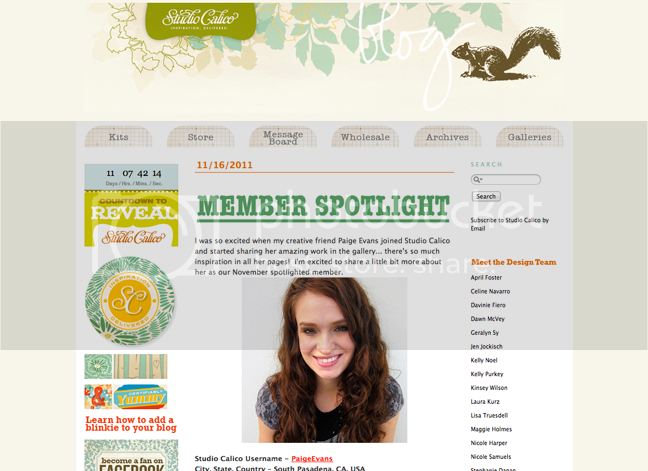 I remember once reading on your blog that you would love to design for Studio Calico - happy for you!! Love your big trees with the leaves and journaling! this is SO fun--I just love how you scrap outside the box, truly inspiring and CREATIVE, plus BEAUTIFUL eye candy--it's just AWESOME! Aren't you glad I dragged you downtown and MADE you get a job? I take all the credit. You're welcome. Just saw that !!! congrats!!!!! You are so famous!!!! Way to go! OHHHH! Congrats on your spotlight!! SO excited for you! LOVE your leaves with those little punched squares!! WOW! LOVE:) You are amazing! Hi there, Paige! I've tracked you down, girl! ;) So glad I did because look at this GORGEOUS page! Love, love, love those leaves you created! I am definitely a patterned paper girl, so your use of all these papers together is truly inspiring to me. Love how you've balanced the bold leaves with other calming aspects in the background, and LOVE those sweet photos. Truly adorable and beautiful all at the same time! Paige everyone wants you! :) I loved your spotlight. WOW!! Congratulations - what a gorgeous layout and a wonderful interview!! Woohoo! Congrats on the November SC spotlight! I love to hear more about you and your creating process. What an awesome interview! Love the darling layout! So much details and intricate touches!